Back in 1973, VW launched the Beetle GSR for the European market. Dubbed the ‘Yellow-Black Racer’, it was based on the Beetle 1303 S. ‘GSR’ stands for ‘Gelb-Schwarze Renner’ in German, which means ‘Gold-Black Racer’. Only 3,500 of the original 1973 model were produced as well. Now, for the first time, UK Volkswagen Beetle fans can order a new GSR model with a 210PS petrol turbo engine so it has 'go' to match the 'show'. Only 100 are destined for the UK. The bonnet and the bootlid of the 1973 Beetle were painted in matt black, as were the bumpers, while black trim strips underneath the side windows and black/yellow side stripes above the door sills rounded off the look. Now, yellow and black are the link between old and new – the bonnet and the bootlid of the new Beetle GSR are black once again, and this time so are the roof and the exterior mirror trims. Black/yellow stripes with ‘GSR’ lettering ensure a unique silhouette above the side sills. Yellow painted bumpers in new R-Line design and a larger than standard yellow and black rear spoiler complete the GSR look. Unlike the older Beetle – and for those who prefer something a little more subtle – the new Beetle GSR can also be ordered in Platinum Grey and Black. While the 1973 GSR came with 15-inch steel wheels with 175 size tyres, the latest model features 19-inch ‘Tornado’ alloy wheels with 235/40 tyres. The black/yellow interior of the GSR from days gone by featured a leather sports steering wheel and sports seats. Four decades later, customers demand more, and the GSR comes with R-Line racing seats (with fabric covers and contrasting yellow stitching), a high-grip leather sports steering wheel (also with contrasting yellow stitching) and a badge with the car’s special-edition number (1 to 3,500). The car also boasts an R-Line dash pad, GSR gear stick, leather handbrake lever gaiter and black floor mats with contrasting yellow embroidery. Forty years ago, the yellow/black Beetle had just 50PS. But with its 2.0-litre turbocharged 210PS engine the GSR needs just 7.3 seconds to accelerate to 62 mph. It has a top speed of 142mph, 280Nm of torque from 1,700 rpm to 5,200 rpm, and is expected to return a combined fuel economy of 38.7 mpg with CO2 emissions of 169 g/km. 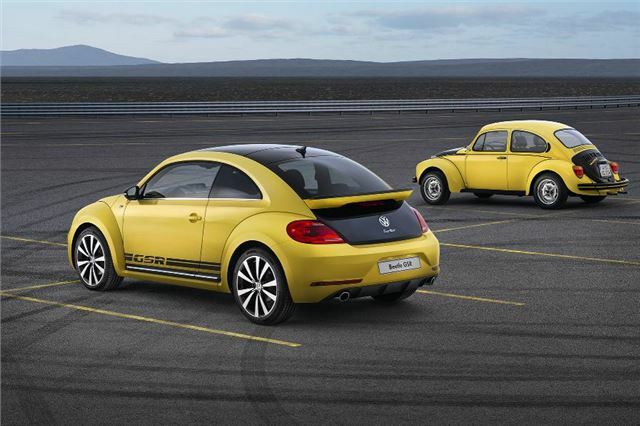 The new Beetle GSR can be ordered with either a six-speed manual or DSG gearbox. The manual Beetle GSR costs £24,900 (OTR RRP) with a £1,500 premium for DSG. The car is available to order now with first deliveries expected in September. Beetle lovers who don’t manage to secure one of the UK’s 100 Beetle GSR models can still get their hands on a faster Beetle: all 2.0-litre TSI models factory ordered from 1-5-2013 come with the upgraded engine, offering 210PS, rather than the previous model’s 200PS.